Martin and Irene describe their updated ranch home in upstate New York as being very modern…except for the old kitchen, which “stuck out like a sore thumb.” They moved into their home in May, and by July had gutted the kitchen and removed the wall between the kitchen and dining rooms to make way for a brand new, little white IKEA kitchen. You’re not hallucinating – those are IKEA handles on those non-IKEA cabinets! Martin and Irene, both of whom have European backgrounds, describe themselves as having “grown up in IKEA.” After lots of IKEA furniture in their childhood homes as well as college dorm rooms, they felt it was only logical to go with IKEA for their kitchen renovation. Here’s how they did it. Modern appliances, please. In addition to a new refrigerator, the new kitchen had to be outfitted with a garbage disposal and a dishwasher. A farmhouse sink. They liked the look of the sink, and they also wanted the space. Glass cabinet doors. If you look at the kitchen from this angle, you see that both horizontal and vertical cabinets have glass doors. The mix of cabinet sizes and cabinet door materials create a lot of pleasing lines in this IKEA kitchen. It’s worth noting that they had really wanted a kitchen island as well. We tried, but an island in this L-shaped kitchen would have left no room for the cook. The dining room has been converted into an eat-in kitchen space. BERNHARD chairs accompany the extendable STORNÄS table in antique finish. (The pendant lamps are from West Elm and you can find them here). None of the appliances are from IKEA; there weren’t enough reviews readily available for Irene and Martin to feel comfortable selecting them. (Take note, IKEA). You can see the little SEKTION legs poking out underneath the microwave high cabinet. Rest assured, the toe-kicks will be installed soon! So, no kitchen island, but you can see they got their wish for the farmhouse DOMSJÖ sink and a dishwasher quite easily. Notice the ceiling light fixtures. The center is the HUSINGE 3-spot track lighting and the one over the sink is the RYMDEN LED 3-spot track lighting. They are planning to fill that empty corner near the window with open wood shelving instead of a cabinet. 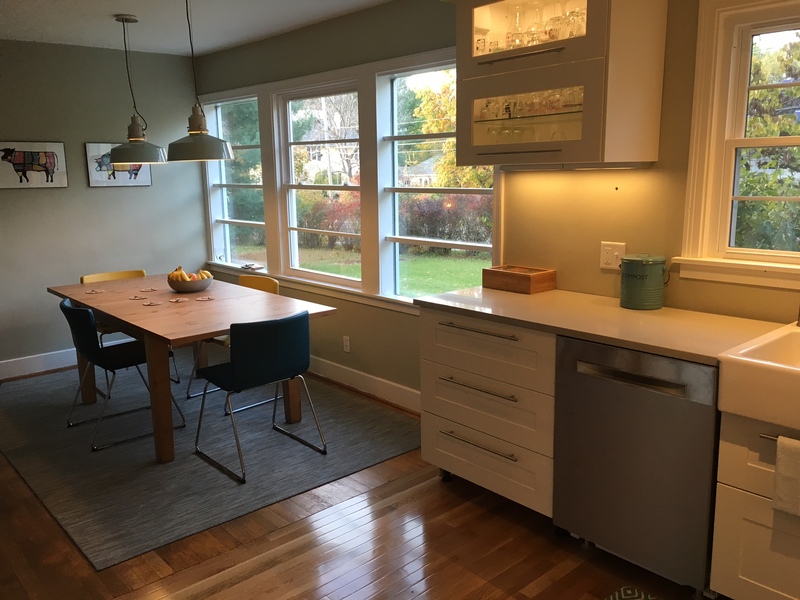 Martin and Irene love their kitchen, but they were generously candid in sharing their post-renovation opinions on choices they had made during the design process. Door and drawer handles are a real commitment. The IKEA handles really vary in size, which means the place where the holes are drilled varies, too. So the handles are not so easy to swap out. Choose carefully. For example, the LANSA handles look nice, but Irene finds they find that the little edges tend to catch things like shirts and towels. Go for the in-cabinet lighting. While IKD doesn’t design lighting, Irene and Martin found they had no trouble planning for and installing the OMLOPP integrated lighting. The SEKTION drawer system is great overall, but the drawers-within-drawers are just okay. Both Irene and Martin are thrilled with the amount of space and easy access to the back of the drawer. Two of the base cabinets have a smaller drawer inside, but so far they have found that they don’t end up using the bottom of the big drawer as much. In hindsight they would have preferred just having the inside match the outside. No really, copy their assembly system. Once all 96 boxes of their kitchen had been delivered, Irene and Martin moved them into the basement. Then they assigned each cabinet a number, taped that number up on the wall, and put everything that went with that cabinet under the number. They noted that the IKD “extra items” shopping list made this incredibly easy. Putting together SEKTION cabinet frames together is easy. The drawers are a little more difficult. MAXIMERA drawers require more precision because of their curved sides. Once you’ve assembled a couple of them, however, it’s smooth sailing. Assembling the cabinets is the easy part of the installation. Irene offers this advice to future IKEA kitchen buyers: the cabinets are the focus of the design part of the process. But during installation, it’s really the finishing touches that will take a lot of your time. Do you have the tools and the skills to cut cover panels, filler pieces, and plinths, and then install them the right way? Irene and Martin realized quickly they would need help with this part. 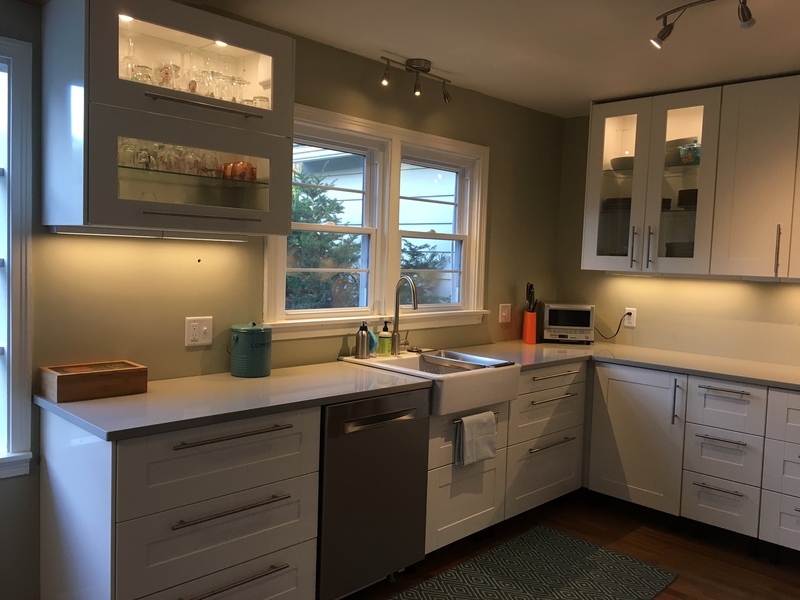 Martin and Irene are almost done with their kitchen, feel great about having been able to do so much of the Ikea kitchen renovation project themselves, and love the outcome! Lovely kitchen! We are planning ours now. Do you have the name of the counter top? Looks like quartz? The new kitchen is spectacular! I love the in-cabinet lighting and the lovely countertops. What a magnificent renovation. Can’t wait to see it. I found that pretty refreshing myself. We like to tell the “real” story to our customers and Irene was very helpful with that. Thank you! Martin and Irene did a fantastic job putting their kitchen together and coordinating all of those interior design details that make a house a home. Hi, Wondering about the rymden lights. It appears from IKEA info that you can’t replace the bulbs once burned out. Can you replace individual lamps? Or, must you replace the whole unit (all three lights)? Are you classic or cottage? An additional benefit of IKD is Install Connect. We provide access to a wide range of IKEA kitchen installers across North America. Get Inspired by IKD. Discover and Share.